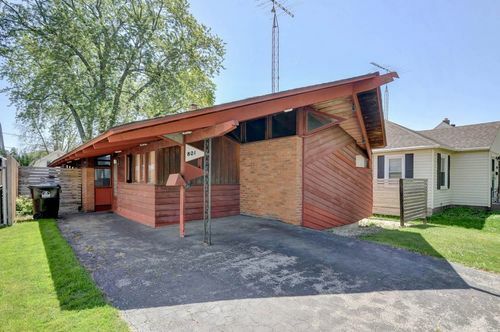 Unique opportunity to own the first home built by John Randall McDonald, an understudy of Frank Lloyd Wright! This one-of-a-kind 2 Bedroom, 1 bath home features original hardwood floors throughout, beautifully remodeled bathroom, & an industrial galley style kitchen that creates a practical, space-efficient flow. Each room of this incredible home receives natural light from all directions! Lower level Rec room with NFP. Enjoy views of your private yard from the spacious deck perfect for casual entertaining! This property is full of surprises and can become whatever your imagination allows!